Mal's work combines mediums such as sound, video, scultpure, photography and performance, focusing on sound and vision as tools of investigation in search of questioning systems of knowledge that are the foundations of lineal and authoritarian perceptions of History and the political, making them visible and even unleashing intern contradictions within their power mechanisms. -Andrea Ancira, curator and researcher. Her work has been part of solo and group exhibitions at venues that include Museo ExTeresa, Cd de México; Armory Center for the Arts, California; Meinblau e.V., Berlin; Laboratorio Arte Alameda, Mexico city; FOFA Gallery, Montreal; The Wand Gallery, Berlin; BB15, Linz; Whyte Hotel Space, NYC; Lakeeren Gallery, Mumbai; FILE, Sao Paulo; INARSS, London; Jumex Foundation/Collection, Edo. de México; Institute of Graphic Arts (IAGO), Oaxaca; and National Stamp Museum (MUNAE), Mexico city. She is currently recipient of the National Fund for the Arts (FONCA), 2018-2019. 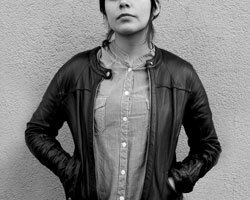 She has received fellowships and awards such as the Skowhegan School of Painting and Sculpture Support 2016; two times fellow of the National Fund for the Arts (FONCA) 2015-2016 and 2011-2012; 1st prize winner of the International Video and Electronic Arts Festival Transitio in 2013; recipient of the Support Program for Production and research in Art and Media 2012-2013, and a participant of residencies such as Skowhegan School of Painting and Sculpture, Maine 2016; Singuhr Projects, Berlin 2016; BB15, Linz 2016; Casa Wabi, Oaxaca 2015; ArtHub Residency, Abu Dhabi 2015; Cité des Arts, Paris 2014; and Museograbado, Zacatecas 2011.